Industrial customers have seen Relyum platforms as a valuable key to unlock the data from their processes and machines in order to achieve higher productivity and to enhance final product quality. Nowadays, Relyum platforms are present in Smart Factories and also they are used to be directly integrated in Smart Machines. 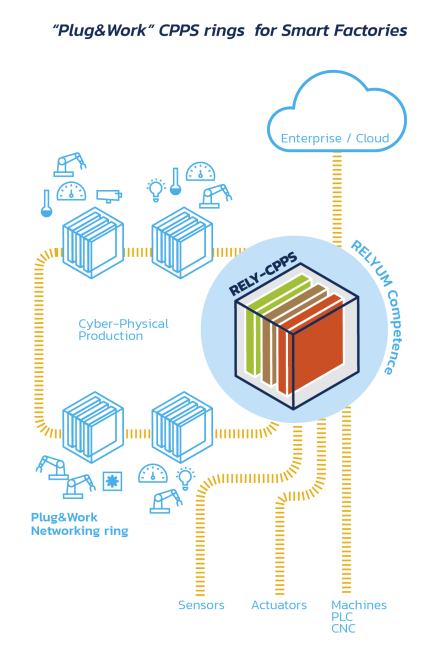 The Relyum competence in the Smart Factory scenario is providing sensor fusion, Edge computing capability and seamless OT/IT integration. As an example, the fiber optic GbE HSR rings implemented in some factories with Relyum devices are interconnecting with a true “Plug&Work” solution each heterogeneous production area. The key platform in this context is RELY-CPPS. RELY-CPPS communicates with the PLC and CNC machines placed in each area, accessing to the production and internal status information. This equipment allocate up to 4 extension modules. In this context it is very useful the Sensor Module which provides sensor interfaces to capture additional valuable information like environmental data, vibration and power consumption status. This information is preprocessed in-site and it is sent to the Enterprise and Cloud services if required. It is very common sharing bidirectional data with the MES/ ERP systems and providing continuous monitoring information to external databases. It is feasible as well, integrating the unlocked data with machine learning solutions. In the context of Smart Machines, RELY-CPPS platform is directly integrated in the machine by the OEM manufactures in origin or as a retrofiting. Thanks to this add, they can offer to their customers corrective and predictive maintenance and advanced connectivity capabilities integrated in the equipment. RELY-CPPS with Data Logger Module and Sensor Module is an ideal solution for direct integration in the Smart Machines. This local storage capability is useful in customers´ scenarios where the network connectivity with Enterprise and Cloud services cannot be ensured.